Truth be told, it isn’t the easiest place to find. 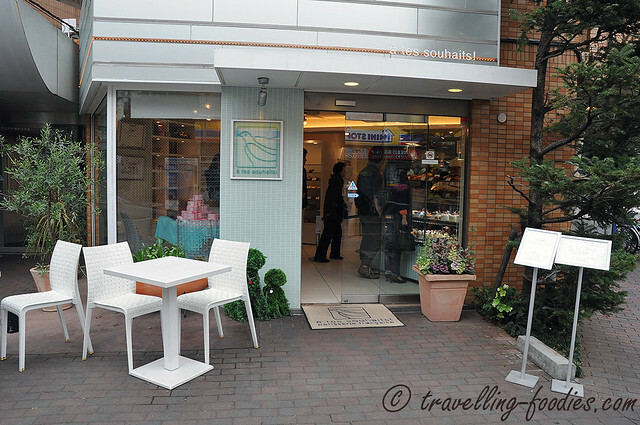 Kawamura-san’s pastry shop lies to the west of the city area and is an approximate 15 min ride by train from Shinjuku. After getting off at Kichijoji, we had to take a bus from the terminus just outside the JR station which brought us around the residential area of suburban Tokyo before getting there. 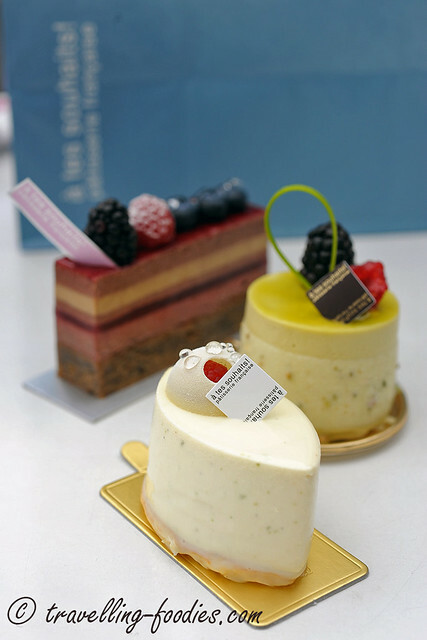 And please don’t expect something grand and posh like Pierre Herme’s flagship store at Aoyama or Sugino’s dessert boutique at Kyobashi. It doesn’t even have indoor seating. 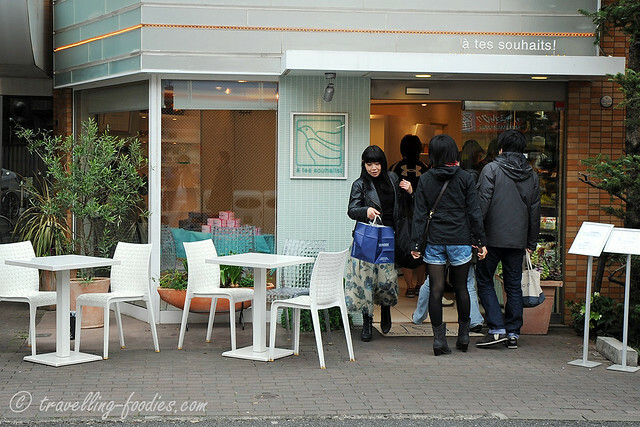 Patissier Hideki Kawamura’s Patisserie a tes Souhaits looks quite quaint as one takes a peek into its interior. 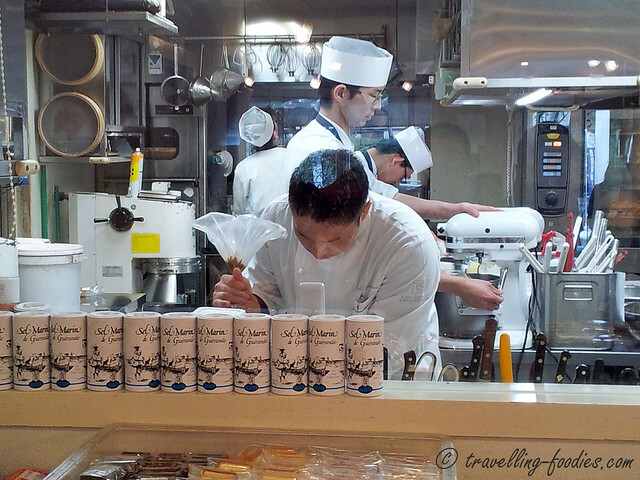 The chiller display flanks diagonally across the shop from the door to maximise the economy of space, with a see through glass wall that separates the sales section from the kitchen area, where more than half a dozen pastry chefs busy themselves, including Kawamura-san seen here piping some ganache on a piece, churning out his creations to cater to those who have come from near and far for his cakes and bakes! Acidulé is his signature in his pastry shop. It is an petit gateau with a passionfruit and mango gelee core with a green lime white chocolate mousse sandwiched between layers of lime genoise. The balance of flavours was immaculate and precise, sweetness from white chocolate which would otherwise have been too cloying nicely contrasted against the tartness from the passionfruit and lime. 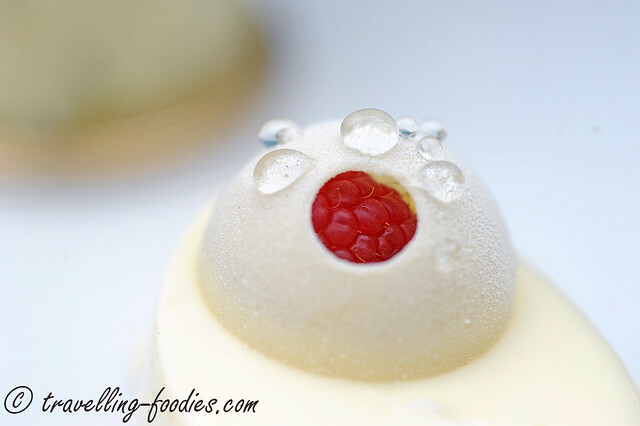 The white chocolate dome decor on top has a round cut out, allowing the single fresh raspberry sitting on a small pool of raspberry coulis inside to peek through slightly. Complete with droplets of glucose above, the inspiration according to Kawamura comes from the ladybirds one would encounter flying around and in his words, “dancing in the lush green meadows” after the morning rain. It sings of summer and though summer was a bit too early when we were in Tokyo, we could thoroughly appreciate his thoughts channeled into this piece through the complexity of flavours designed to re-create such a beautiful scene. 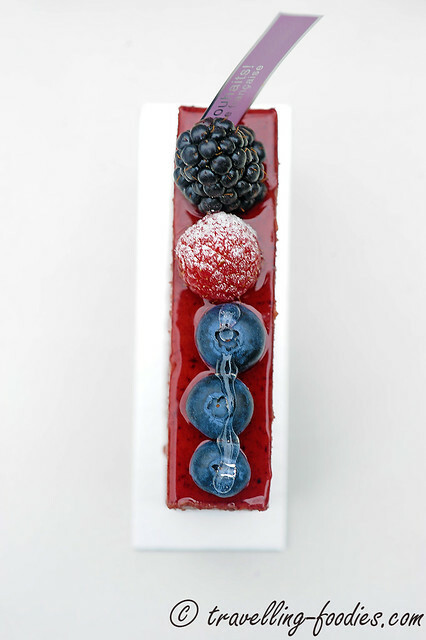 Douceur aux Mures is an entremet with an interesting composition, the pairing of earl grey and blueberries. 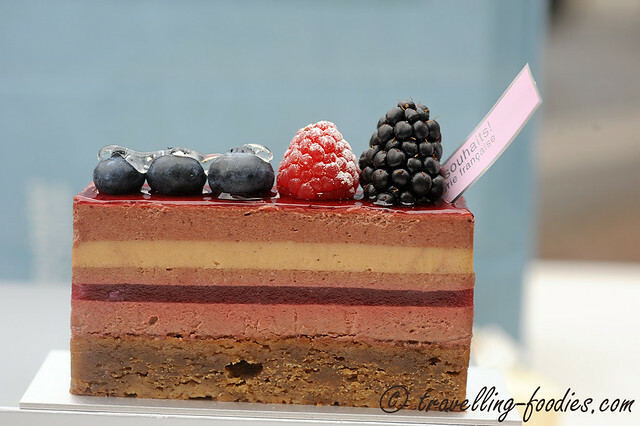 It contains alternating layers of milk chocolate and earl grey mousse and a layer of gelee au fruits aux rouge in the middle. 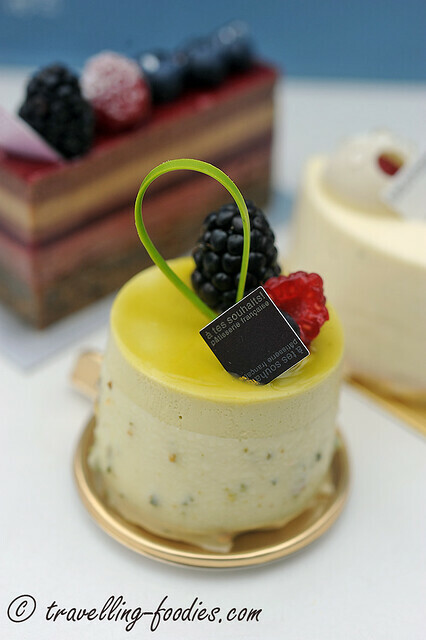 The base is a gateau infused with earl grey as well and embedded with dried blueberries. On the whole, the piece is aromatic from the use of earl grey in several of its components. The blueberries were rather mildly represented despite having the piece named after it. 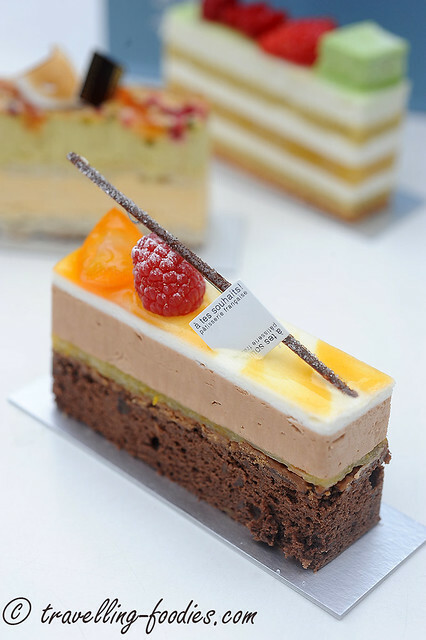 I would have loved the fruity flavours to be brought out more prominently but for those who love a tea-infused confection, this creation by Kawamura would have been perfect. Nougat Fruits des Bois is another interesting piece. It is essentially a pistachio mousse cake with very unexpected group of components brought together. The core was a compote of redcurrants and raspberries which has an almost lava-like consistency as one cuts through. 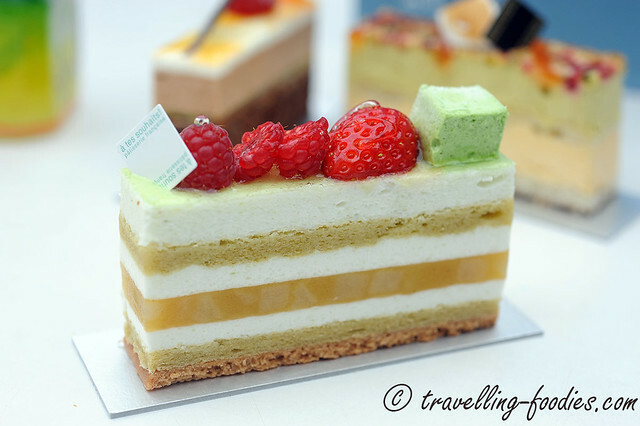 There is also a pistachio-flavoured joconde sponge layer above it but the surprise comes from the ring of white chocolate that is wrapped around the mousse which has nougatine embedded in it. The flavors of the pistachio mousse was really subtle initially but the flavours became more apparent with each bite. The nougatine was delightfully aromatic from the bits of roasted almond and pistachio within. 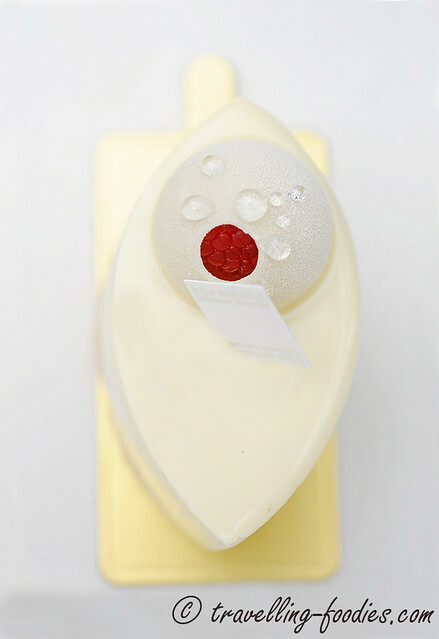 To get the white chocolate nougatine so thinly layered and perfectly wrapped around the mousse is sheer artistry. Limone is yet another piece with quite an unexpected combination of flavours from lemon and praline. 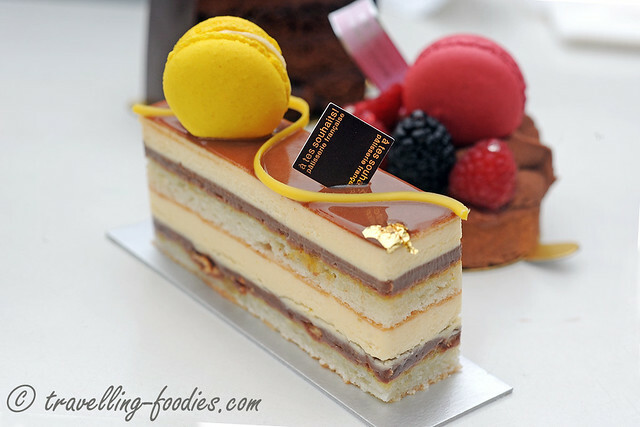 The composition of this piece is really simple with essentially 3 components of joconde, praline and lemon cream. The representation of lemon was not as robust as I had hoped for. It was tangy but not tart enough. I would think a little more zesty would do it good too. The praline bits were good with the crunch from the toasted almond bits and milk chocolate ganache but I think the lemony flavours can be tuned up a notch more to make it really exciting. Delicious as it is though, just not stellar as some of the others. 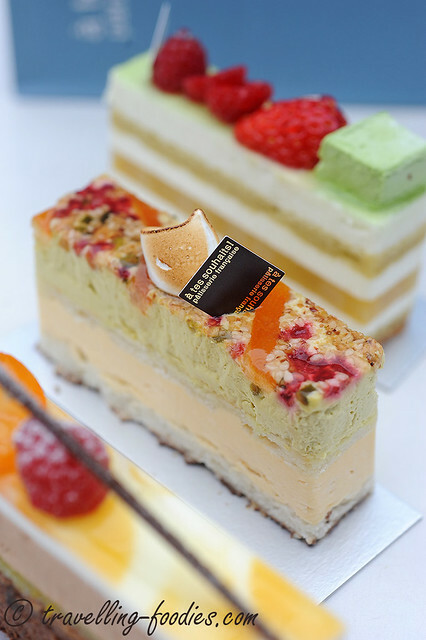 Nougat Montelimar Pistachio is one of my favorites amongst all of Kawamura’s works we’d sampled. It looked amazing aesthetically with the showy layer of “nougat” which contains toasted and chopped almond, pistachio, sesame and orange confit scattered over the surface and set with some raspberry confiture and honey. The pistachio bavarian cream was yummy to say the least but the real surprise which may go easily unnoticed was the thin layer of chocolate with toasted sesame seeds as well. One would usually think of the melted chocolate at the bottom as merely being functional to secure the cake onto the cake board but Kawamura’s display of attention to detail is amazing by making it an integral part of the piece. 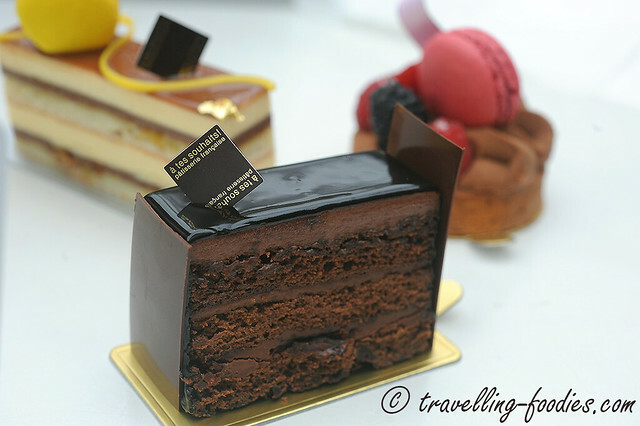 Fortissimo which we enjoyed together with the earlier Manzana Verde, is a simple dark chocolate entremet with rich and moist chocolate cake layered with ganache and dark chocolate mousse. It was rich and luxurious in texture, the chocolate sufficiently dark for our taste but rid of the acridity we sometimes get as what is often touted as “good artisanal chocolat au noir” nowadays, a notion I don’t really take to very much. As its Italian name suggests, it is a piece so rich that would almost immediately sweep one off the ground, and thus better enjoyed over a cuppa strong tea and a light piece for contrast. 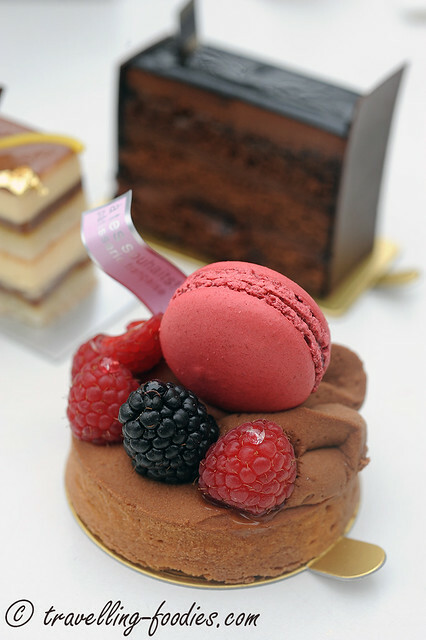 Tarte Chocolat Framboise, a name that said it all about its composition. Or so we thought. 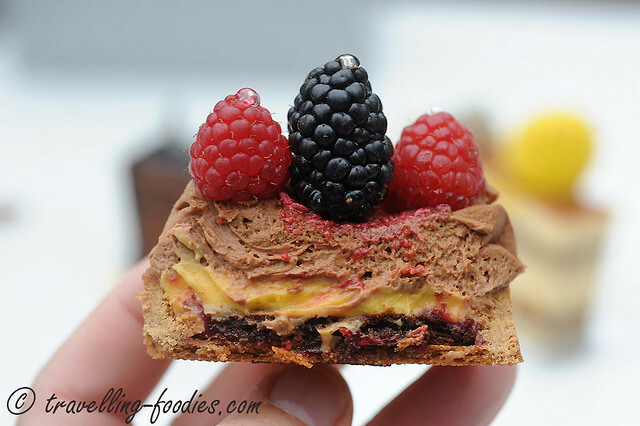 Built in the standard pate sucree base, the bottom is laid with a layer of framboise pepins and then a dark chocolate joconde layer, a generous piping of passionfruit cream before the finale of milk chocolate mousse on top with fresh fruits and a macaron filled with raspberry confiture. Prima facie, it reminds much of Pierre Herme’s mogador flavour combination of milk chocolate and passionfruit, only that it tried to do much more with raspberry incorporated as well. I love it for the tart flavours, much like in Acidule, passionfruit and raspberries now against the sweet milk chocolate. The tart base was reasonably well made and baked. Very aromatic. I love the fact that the raspberry seeds were deliberately left in the framboise pepins for the additional textural dimension. Opening hours from 11 am to 7 pm daily or until everything sells out which happens usually around mid-noon. 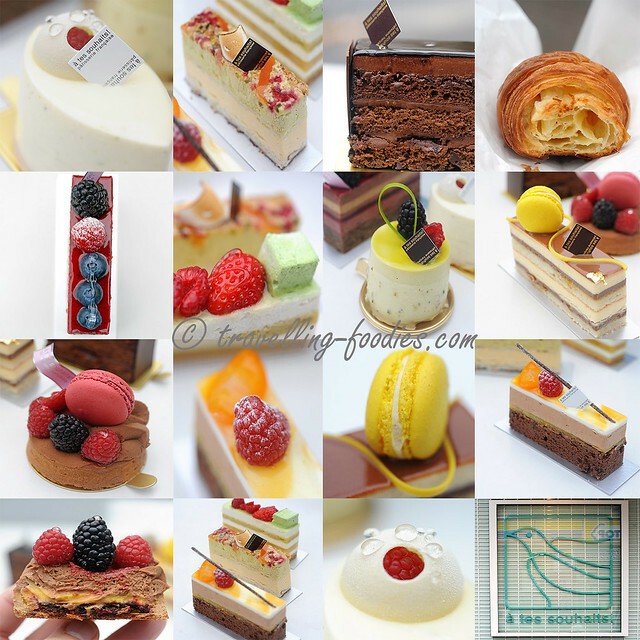 This entry was posted on December 24, 2015 by Alan (travellingfoodies). It was filed under Food, Travel and was tagged with A Tes Souhaits, acidule, Hideki Kawamura, kichijoji, Tokyo, 吉祥寺.